Udupi is a well-known district in Karnataka. It is a coastal town with beautiful and aesthetically pleasing temples, unexplored beaches and verdant forests. Udupi is most famous for its cuisine and Udupi Hotel is famous not only in India, but also overseas. Udupi is encompassed by the Arabian Sea on one side and the Western Ghats on the other. It is an important holy city for the Hindus. Udupi is known for the Sri Krishna Temple and Ashtamatas. It is also one of the oldest religious educational concourses in India. It is a belief that Udupi gets its name from the Tulu name - Odipu. Udupi was a part of Dakshina Kannada district. In 1997, Udupi, Kundapur, and Karkala were separated from the Dakshina Kannada district to form the Udupi district. Udupi is extremely hot in summers from March to May. It is also accompanied by high levels of humidity. Monsoons from June to September see a rainfall averaging more than 4000 mm. It is accompanied by heavy winds. It can be discombobulating. Winters from December to February are pleasant with minimum temperature being 20 degrees Celsius. Therefore, winter season is highly recommended for visiting Udupi. By Air: Mangalore International Airport is the closest airport to Udupi. From Bangalore, there are usually two to four flights in a day. The fly duration is 50 minutes. Udupi is nearly 54 km from Mangalore. By Train: Udupi has its own railway station. Karwar Express (train number 16523) runs from Bangalore to Udupi on all days of the week. By Road: There are three routes to get to Udupi from Bangalore. Route 1: Bangalore - Channarayapattana - Sakleshpur - Mangalore - Udupi; via NH 75. Distance covered: 403 km. Time taken: 7 h 32 min. Route 2: Bangalore - Tumkur - Hiriyur - Thirthahalli - Udupi; via NH 48. Distance covered: 438 km. Time taken: 8 h 47 min. Route 3: Bangalore - Mysore - Madikeri - Mangalore - Udupi; via NH 275. Distance covered: 443 km. Time taken: 9 h 9 min. We recommend route 1, since the time and distance are remarkably lower. Start from Bangalore and drive towards Channarayapattna, which is at a distance of 146 km from Bangalore. In around 2.5 hours, you'd have touched Channarayapattna. On the way is the Adichunchunagiri Math, which is a religious concourse for the Vokkaliga community. Shravanabelagola is an important and most popular pilgrimage destination among the Jains. It is famous for its 57-feet Bahubali statue, which is the tallest monolithic stone statue in the world. Channarayapattna to Sakleshpur, which is next on the route, is 76.6 km and takes about an hour and a half to reach. Sakleshpur is a beautiful location to go on treks. Green Route Trek is one such trek that starts from Sakleshpur and ends at Kukke Subramanya. Hiking the Jenukkal Gudda is another activity that one can do in Sakleshpur. Manjehalli Waterfalls is a lovely waterfall in Sakleshpur. The Sakleshwara Temple is an ancient temple that is dedicated to Lord Shiva. It follows the Hoysalan architectural style. Mangalore, at a distance of 130 km from Sakleshpur, is next on the way to Udupi. You will reach in about 3 hours. The Panambur Beach is one of the most loved beaches in Karnataka. A kite festival is organized here during April. The Kudroli Gokarnath Temple is a temple built here for the oppressed class, as they were denied entry into certain temples. The presiding deity is Gokarnatheshwara, also known as Lord Shiva. The Kadri Manjunath Temple has heavy influence of Buddhism on its architecture. The chief deity is Manjunatha, aka Lord Shiva. The Panambur beach can get a little crowded at times. Ullal Beach can prove to be quite an escape during such times. Sultan Battery was a watch tower built by Tipu Sultan to watch the proceedings in the Gurpur River. The beauty is that it looks like a fort and less like a watch tower. However, it is in ruins today. Someshwara and Tannir Bhavi are some of the other stunning beaches in Mangalore. The Mangaladevi Temple is another prominent temple, from which the name Mangalore seems to be derived. St Aloysius Chapel, Rosario Cathedral are some beautiful chapels that can be visited in Mangalore. Udupi is an hour away from Mangalore. It is roughly 56 km. 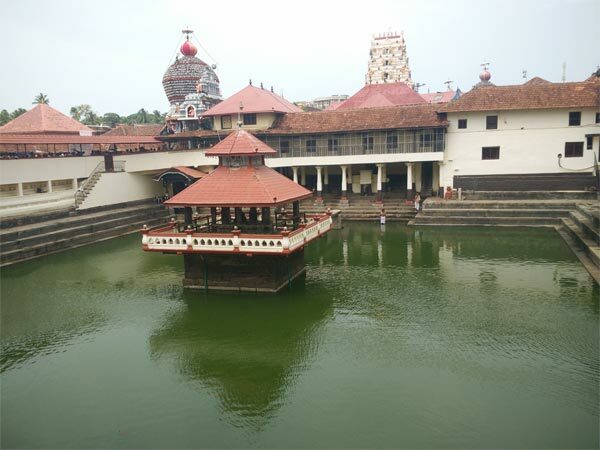 Udupi is known for its Krishna Temple. The Udupi Krishna Math was built by Madhavacharya in the 13th century. It is believed that the world-famous Udupi cuisine was born in this temple. The priests were blessed with the responsibility of providing hygienic and simple, yet tasty meals to the Lord. This found its place into many people's hearts, especially the dosas. People started to adapt these recipes and hence many Udupi hotels have sprung in India and abroad. There are many legends surrounding this temple. In the 16th century, the poet Kanakadasa was refused entry into the temple, as he belonged to the lower, oppressed caste. As he could not enter the temple, he tried to get a peek of the Lord using a small, rough hole/window. Much to his grief, he could only see the backside of the Lord. Legend has it that Lord Krishna turned himself to reveal to Kanakadasa. Kanakadasa sang songs about this incident. The window hence came to be known as the Kanakana Kindi. Ashtamatas (eight matas/monasteries) was established by Madhavacharya to propogate the Dwaita school of philosophy. The eight matas are Pejavara, Palimaru, Adamaru, Puttige, Sodhe, Kaniyooru, Shirur, and Krishnapura. Udupi is the place of origin of Syndicate Bank and Corporation Bank. This temple dedicated to Lord Krishna has his statue in the form of an infant, because his mother Yashoda wanted to see him take the form of a child. Sri Krishna Temple is the birthplace of Dasa Sahithya, which is a form of literature. The Lord is worshipped only through a window that is garnished with nine holes. This is called Navagraha Kitaki. The temple is extremely crowded during the weekends. Do not forget to taste the prasadam - that is what food of the Gods must probably taste like. Kaup Beach, Malpe Beach, Trasi Maravanthe Beach, Mattu Beach are the most famous beaches in Udupi which are very serene with pristine pure waters and picturesque views. You can plan for a mini-picnic on the beach. The beaches have adventure sports like surfing, para-sailing, rafting, etc. Situated in Manipal, Hasta Shilpa is a village that showcases traditions, values, and history in the form of artefacts, art, buildings, etc. The museum of folk arts inside the village is one of its kind and the most coveted one in India. This is the place where Vasco Da Gama first landed in India. This tiny island off the coast of Karnataka has white sand beaches. St. Mary's Island is a collection of four individual islands namely Coconut Island, North Island, South Island, and Dariya Bahadurgarh Island. The island is famous only for its beaches and the tourism is not fully developed yet. However, a ferry ride to the island to catch the sunset is a must. This museum/memorial to Shivaram Karanth, a Jnanapith awardee is situated in Kota village of Udupi. The idea behind establishing this bhavan is to preserve the memory of Karanth at his birthplace. It consists of a big theatre (ranga mandira), a library with many of his books, a Bal Bhavan (for children) and a Karanth pond (kola). Anegudde means elephant hillock, quite literally. Also called Kumbashi, it is 30 km from Udupi. This hillock has a Ganesha temple at the top. It is believed that this hill is one of the several pilgrimage places created by Parashurama. This sanctuary has semi-evergreen and evergreen forests. This is in close proximity to the Kudremukh national park. Some of the species spotted here are Tiger, Sambar, Gaur, Jackal, Langur, King Cobra, Python, Whistling thrush, Malabar Trogon, etc. A beautiful waterfall 40 km off Udupi, Koodlu Theertha waterfall is the first waterfall of River Sita. The water drops from a height of 126 feet and directly into the plunge pond. This pond is believed to be holy, and the water has medicinal properties. Established by Corporation Bank, this museum has rare coins and is a paradise for coin lovers. It houses coins and currencies that are almost 3500 years old. This museum was the first Corporation bank that was started in the country. You can also see barter objects of trade from that era.